Starting off with all these introductions simply explains my book review choice for today. ‘Murder and Thriller’, to be precise. 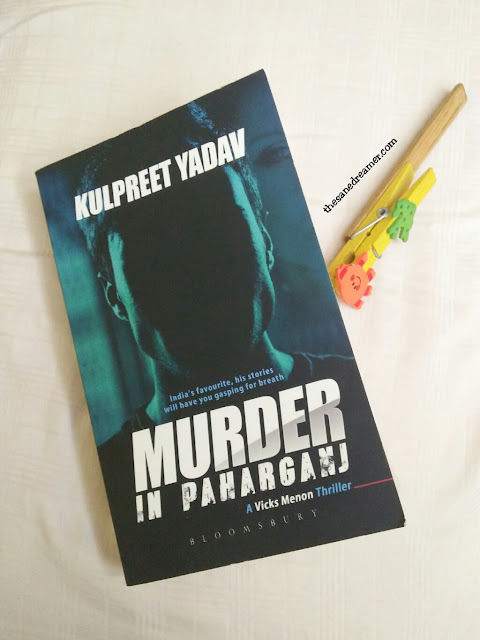 I will be talking about the book ‘Murder In Paharganj’ by Kulpreet Yadav. Being a thriller fan I wasted no time to devour the book when the author sent me a copy. However, a little confession to be made i.e. I couldn't really finish the book on the time which I have set. And, the reason for the late read led to a very delayed book review, which I should have done before. Okay, so without much ado... Read what I had to say about this book. On a cold December morning, a white woman is found murdered in a cheap hotel in Paharganj, New Delhi. Vicks Menon, an out-of-work journalist, is tipped off by the hotel's receptionist and is the first to arrive at the crime scene, where he discovers a lead. It's the bus ticket used by the dead woman two days earlier. But Vicks is battling personal trouble. He has no money, an alcohol problem, and a nearly broken relationship with Tonya, his estranged live-in partner, a clinical psychologist who specializes in profiling hardened criminals. Moving in and out of the shadows, Vicks pushes his investigation harder as it takes him from Udaipur to Bangkok. On his side, for resources, he has a nameless intelligence operative, and to read minds, a lover who is beginning to trust him again. But above all, his instinct to stay inches ahead of death will be the key to his survival. If Vicks lives, this is one story that will change his life forever. The story recounts the story of Sherry Bing, a white woman who was found murdered in a cheap hotel in Paharganj, New Delhi. The first to arrive at the crime scene is an alcoholic out-of-work journalist named, Vicky Menon, he was tipped off by the hotel receptionist and he discovers a lead. Vicky decided to go deeper into the murder mystery as he wanted to prove his worth as a journalist. Amidst the investigation, Vicky does not realize that the murder he is trying to investigate is a high profile one with the fate of three-nation tied to it. Wish to know what happens next? Grab a copy today at Amazon.com. In the meantime, you can read my review of the book. The author's narration was gripping with clear and lucid inputs which were indeed obliging in making you understand the crime scene, the characters were interesting, but it could have been developed even better. The transition of some of the scenes were brilliant, but, the plot line didn't quite make this book up to the mark I was expecting. Not saying it was a bad read, but I was disappointed to discover that the story failed to impress me unlike the amount of hype it garnered on social media. Since I am a thriller buff and I have had read lots of mystery books by International writers, so this could be one probable reason why it did not give me the 'thrilling' factor. On a good note, the story seemed engrossing in the beginning, but somehow along the middle, it did not quite hold my attention span and I had to keep it aside for some refreshing read (thus the delay of this review). The author’s attempt to create a crime scene and a suspicious/mysterious aura was missing, Vicks, the main protagonist could have been portrayed a little interesting. The elements of thriller I was looking for seems to have got lost along the narrative construction. It started off with a promising account but soon lost its enigmatic vibe. I also felt that the ending came as sudden and abrupt. it was an ‘okay-ish’ read for me, although not a page-turner after the first 100 pages. On the contrary, I would surely recommend this book to those looking for a crime story by an Indian Author. Also, a first-time crime genre reader will enjoy this book since it is action-packed, fast-paced and legible. Disclaimer: Thanks to the Author for sending me a copy.